Good things- Traded proper share size and averaged in on trades. Woke up late and missed the open. Gave back money in the afternoon by fighting the trend. Covered AAPL short for 60 cents after shorting at 158.8, should have held for another 2 dollars. 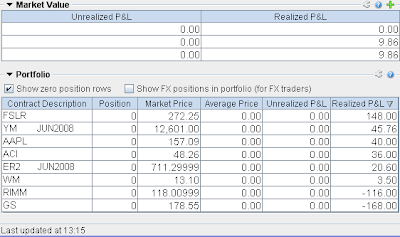 Accidently bought AAPL on 2nd short attempt instead of putting in BUY STOP for my short trade.